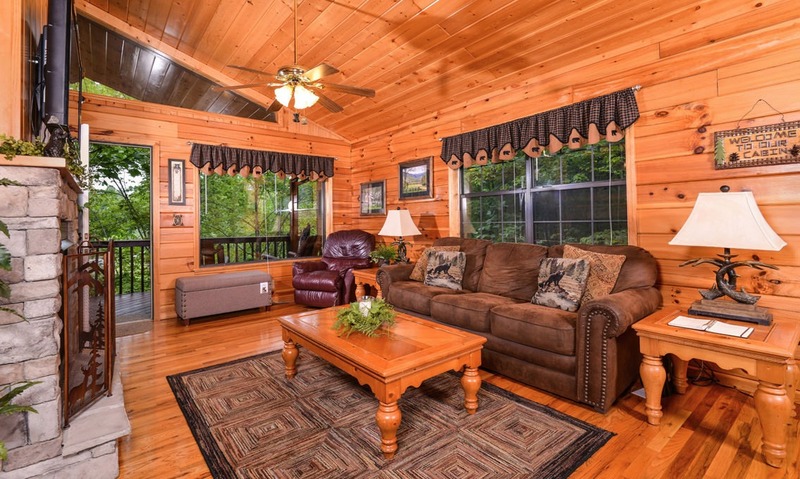 Located in the Hidden Springs Resort, Bear Essentials boasts a log interior, beautiful hardwood floors, and classic cabin décor, along with access to community perks. 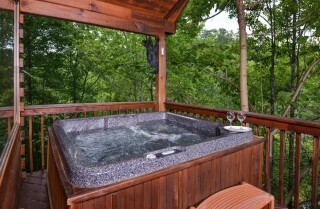 Enjoy year-round fun at the community pool or relax in the outdoor hot tub at your cabin. The 1-bedroom, 1-bathroom cabin is perfect for a romantic getaway or a family vacation, with a king-size bed, high-speed wireless internet, big screen HDTVs, an indoor jetted tub, and room for 4 guests. 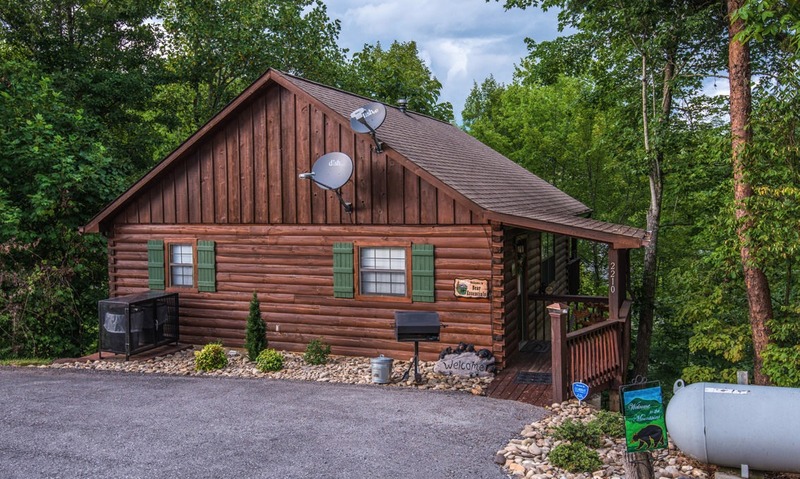 Enjoy the security of a gated log cabin community, the peace of wooded views, and the amenities of your own semi-private cabin. It's also less than 6 miles from downtown, so you can hop in the car and take the short drive to nearby restaurants, shops, and family-friendly attractions! 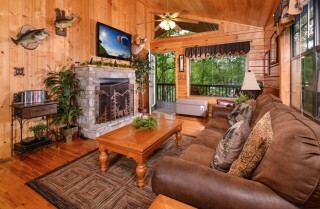 Offering a homey yet lodge-style feel, the spacious living room of Bear Essentials is the perfect place to relax after those long days of exploring downtown. Above the stone gas fireplace is a 46-inch HDTV with satellite where you can watch your favorite shows or ballgames. The comfy queen sofa sleeper (new in Spring 2018) sits next to a cozy leather recliner– 2 great places to kick back and relax on a cool Smoky Mountain evening. Keep snacks and drinks nearby or play some cards and board games on the spacious coffee table in the center of the room. As you play and relax, stay warm by the fire or flip on the ceiling fan to stay cool. 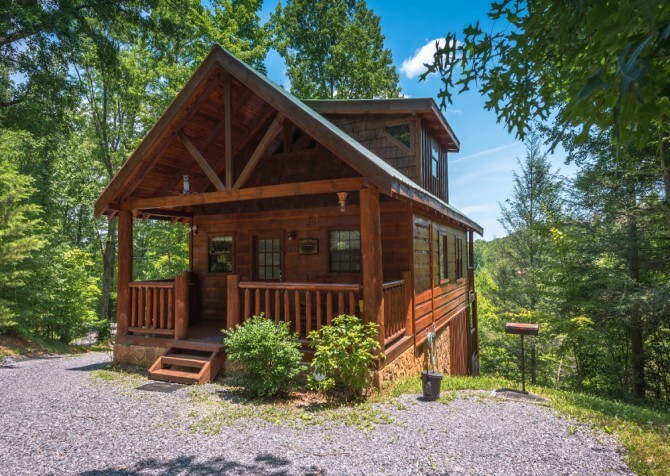 A large window frames the wooded views and allows for some natural light to flow in – great for enjoying sunny mountain days. A deer and fish are mounted above the fireplace, and an antler lamp provides the perfect reading light from where it sits on the side table by the sofa. On the days when you just don't feel like leaving the cabin, you'll appreciate the comfort and homey atmosphere this space provides. 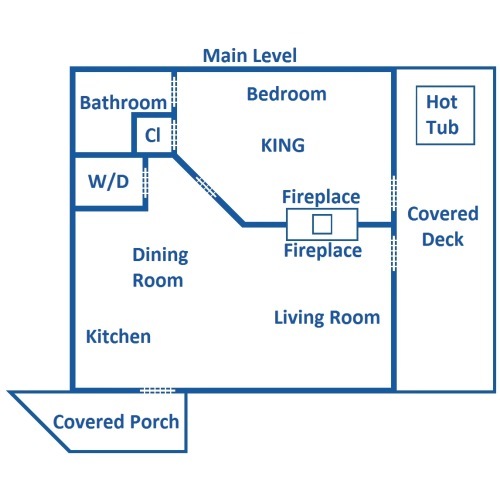 And with an open-concept layout, guests can visit while cooking, relaxing, and dining. If you need some extra sleeping space, take advantage of the queen-size sleeper sofa located here. 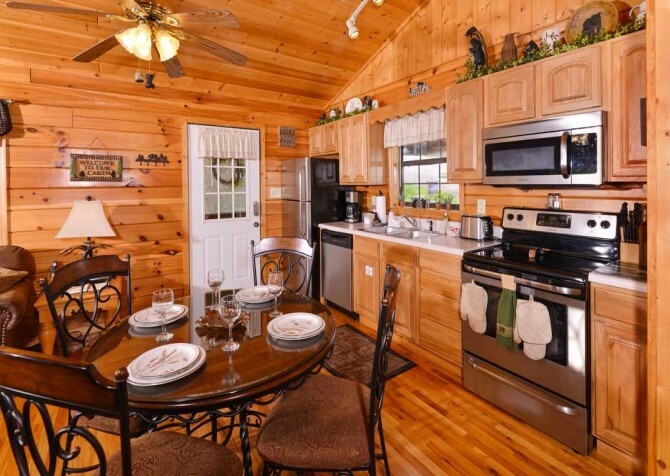 Just off the living area is the fully equipped kitchen, offering everything you need to make meals or whip up snacks for while you're around the cabin. The elegant kitchen boasts brand new full-size stainless steel appliances, and the tools and essentials you need – coffeemaker, toaster, knives, dishes, glasses, and utensils – for romantic dinners or family meals here. If you don't feel like cooking, order our romantic dinner for two, which includes all the ingredients you need for a candlelit dinner, all waiting for you when you arrive in the cabin. Just toss the steaks on the grill, bake the potatoes in the oven, and enjoy a beautiful and delicious dinner for two. 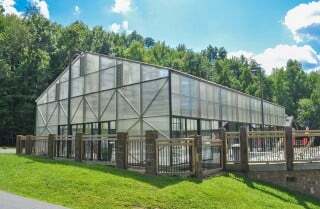 Or you can visit one of the Pigeon Forge dinner shows such as the Lumberjack Feud or Hatfield & McCoy for a hearty dinner and great entertainment, leaving the cooking to someone else. 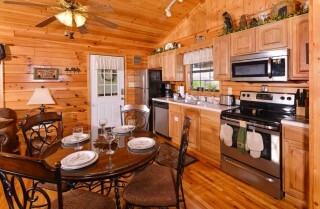 Enjoy in-cabin meals at the lovely dining table in the kitchen. The elegant round table is surrounded by four iron chairs and offers a nice place to have meals. 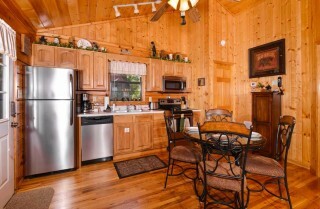 Cooking and eating in the cabin is a great way to get some extra quality time with the ones you love. The table is also the perfect spot for a romantic meal as a couple. It's conveniently located between the kitchen and the living area, so you can fill the table with game-day snacks or easily get up for seconds during your big Southern breakfast. With vaulted ceilings and large windows that frame beautiful wooded views, the master suite is a peaceful retreat for couples to relax and unwind. 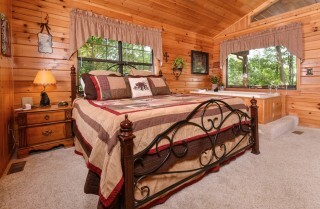 A mountain-themed handcrafted quilt, shams, and pillows adorn the king-sized bed. Enjoy the mattress (new in Fall 2016), which features Comfort Right™ layers of support, integrated Cool Balance™ technology for improved sleeping temperature, and a TrueSense™ design to reduce motion transfer from one partner to the other. 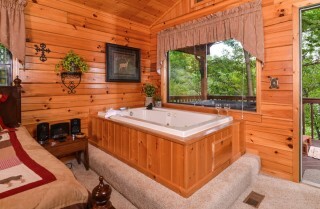 A large window above the indoor jetted tub looks out over the hot tub and the wooded view. With your own door to the deck, you'll have easy access to the hot tub there. The cozy suite also boasts a 32-inch HDTV with DVD player, a dual-sided fireplace, and a dresser where you can unpack. For a truly relaxing night, add one of our gift baskets to your stay. Just imagine having a bubble bath in the oversized jetted tub at night as you have a movie night, listen to your favorite music on the CD player/radio, or just enjoy the peacefulness of the Great Smoky Mountains. Keep phones and tablets handy on the nightstand or flip on the bear lamp so you can read late at night. This bedroom also offers its own bathroom, so you can enjoy plenty of privacy as you get ready for bed or prepare to hit the town. It features plenty of counter and storage space, a hair dryer, a makeup mirror, and a vanity stool that makes getting ready a breeze. 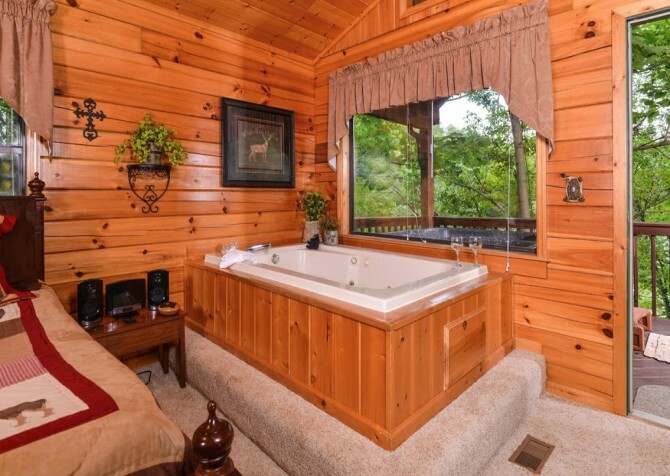 This semi-private retreat will make you want to sleep in late and head to bed early. 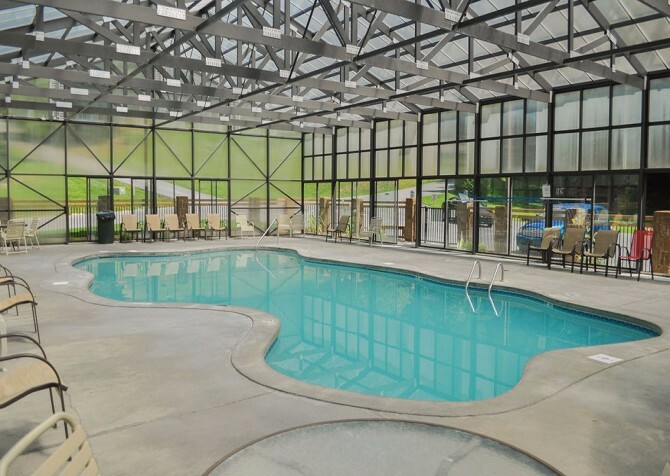 And with so many wonderful amenities right in the room, it will be easy to stay here for hours. The outdoor spaces at Bear Essentials are just as impressive as the interiors. 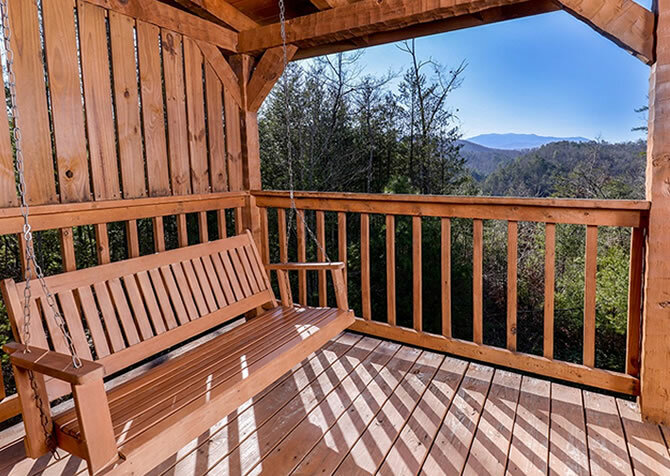 The mild weather and beautiful scenery are two major reasons that people visit the Great Smoky Mountains. You'll definitely want to take advantage of the outdoor areas during your time here. 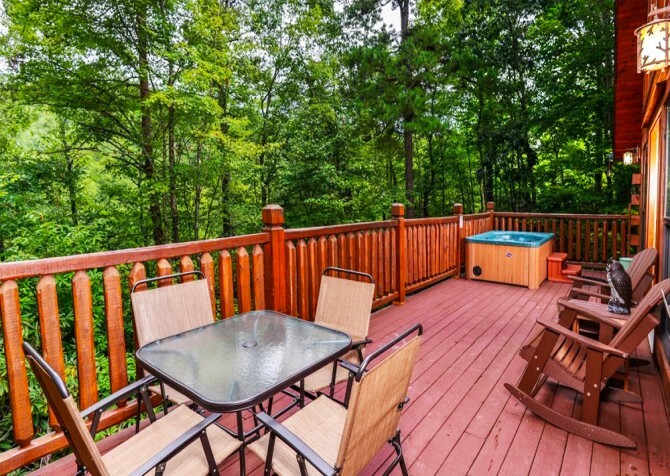 From the covered deck, enjoy wooded views that will make you feel nestled high in the tree tops. On cool evenings, or after a long day of hiking in the national park, take it easy as you soak your cares away in the 4-person hot tub on the covered deck. Because it's covered, you can enjoy it rain or shine. It even features a step that will make getting in and out easier and a natural privacy screen of foliage. Just pour yourself a glass of wine and spend some time unwinding.. What a romantic way to end the night! 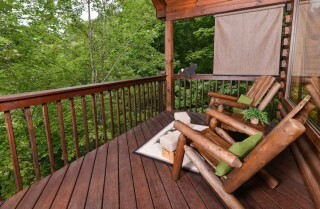 In the mornings, start your day with a cup of coffee as you sit in the log-style deck furniture. 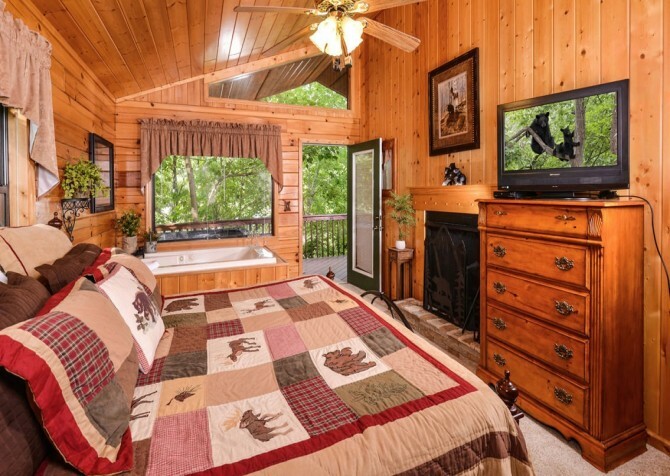 Kick off your shoes and rest your feet on the bear rug here. Around the other side of the cabin, fire up the charcoal grill for a cookout on a nice day. As you grill, the wooded surroundings and authentic log exterior will give you the Smoky Mountain experience you've been seeking. Bear Essentials also offers a CD player, DVD player, satellite TV, high-speed wireless Internet, and a hair dryer. Offering easy arrivals, the cabin also boasts paved parking and a community snow plow/salt truck that creates better driving conditions in winter. The washer and dryer and iron and ironing board are more perks, making longer stays that much easier. After a day of hiking or before a night out on the town, toss in a load of laundry for some fresh clothes. As guests of the Hidden Springs Resort, you'll enjoy access to the enclosed heated swimming pool – for fun no matter the weather – and free high-speed Internet poolside! 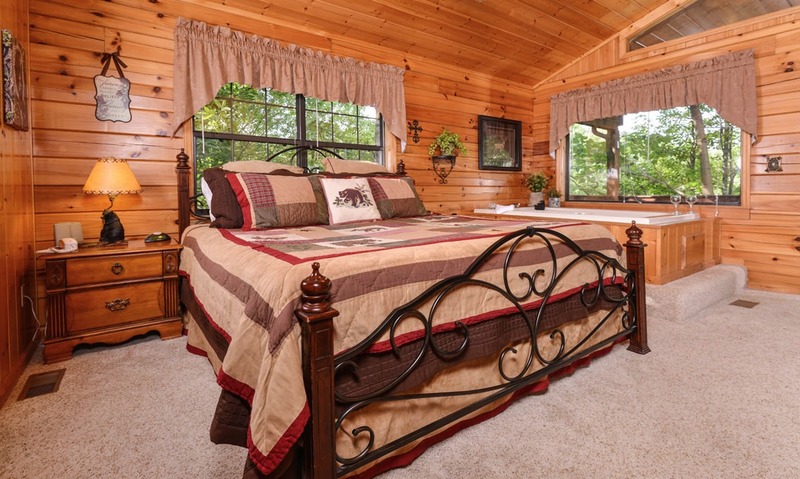 Whether planning a romantic weekend or a fun family getaway, Bear Essentials puts you close to everything the Smoky Mountains has to offer. 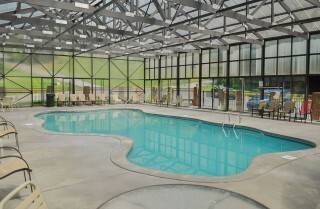 Spend days playing and relaxing around the cabin or head to the community pool to get some sun, float, or splash around. 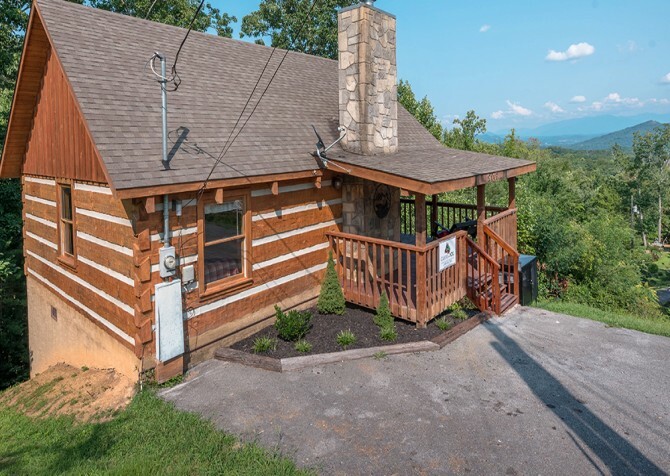 This beautiful Pigeon Forge cabin will feel like home, but it will offer all the amenities you seek in a mountain getaway. 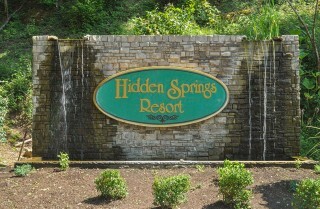 It's just a few miles from downtown Pigeon Forge, keeping you near all the action. Enough for an entire day of fun, LazerPort Fun Center features laser tag, the largest arcade in the Smokies, go karts, and blacklight miniature golf! Grab some ice cream at the Sweet Sensations Ice Cream Parlor before playing games in the 5,000-square-foot arcade. The incredibly detailed and life-like wax figures at this Pigeon Forge attraction will blow you away. You can pose with the celebrities, play trivia games, and pick up some great Hollywood-themed souvenirs in the gift shop. "Very clean ...has the cozy feel to it .. will be returning!"